How to answer challenges of cultural distance in adult education (relating to body, gender, sexuality, disability and health)? If Europe is home to 69.5 million migrants population (IOM -United Nations, Trends in Migrant Stock: The 2008 Revision), a great variety of traditional ethnic / national minorities (Sámi, Roma etc. ), there are further factors that add to its diversity: age, sexual orientation, gender, special needs linked to specific health conditions, disability. Cultural diversity in Europe encompasses this variety of differences and their interactions. If diversity is a potential resource in education activities, when not addressed properly it constitutes a barrier to participation and can jeopardize the achievement of the pedagogical objectives, particularly in fields linked to sensitive issues such as gender, body, health, sexuality. The body brings the first impression in social encounter. It bears the visual markers based on which we categorize each other automatically (age, gender, ethnicity, disability etc) and sometimes judge accordingly. The body also performs the rules of communication and respect – rules that show great diversity across cultures. Indeed, exploratory research (Nann, Varhegyi 2010) has shown that the body, gender, and sexuality become ‘sensitive zones’ in intercultural contact, which means that differences tend to have a strong impact, felt as difficult to adjust to or accept, and sometimes thought of as proofs of incompatibility. If the body, gender and sexuality are connected, they are also linked to key values of all cultures: orientation towards individualism or collectivism, hierarchy, power relations, family, respect, purity etc. This intimate connection to core values and organizational principles explains the many rules, taboos in these domains. It is for the same reason that stereotypes and prejudice connected to differences are difficult to understand and reconcile (e.g. prejudice concerning specific sexual orientations or polygamy. ), and people with special needs / practices face misunderstanding if not discrimination. The importance of these domains is also reflected by the fact that key debates of intercultural coexistence often focus on them (e.g. : migrant women’s integration, the regulation of the use of the veil in public institutions, the prohibition of female circumcision; the prohibition of polygamy). If body, gender and sexuality are ‘sensitive zones’ in intercultural contact there are some areas of adult training where they may be particularly relevant. Such are the trainings related to health issues, trainings focusing on sexuality, parenting, gender issues, and all physical education as well as all intercultural trainings. These same trainings would have the potential of contributing to the mutual understanding of these differences and the recognition of special needs. It works against discrimination, as endorsed in two Directives adopted in 2000 (Directive 2000/43/EC and 2000/78/EC) prohibiting direct and indirect discrimination on grounds of racial or ethnic origin, religion or belief, disability, age and sexual orientation. The ethnocentrism of enclosing others in fixed cultural (national, ethnic, religious, etc.) categories and generalizing, essentialising traits and characteristics ignoring the perpetual changes, dynamics and heterogeneity within each culture. The ethnocentrism of ignoring cultural differences and their impact, often referred to as the universalist bias, which usually hides the assumption that there are no real differences because our approaches, practices are universal. The study, based on the Margalit Cohen-Emerique methodology Critical Incidents, has described and analyzed many valuable lessons about the interplay between culture, body and communications that we have learned and collected through interviews, workshops, training sessions and desk research. Findings include a large number of concrete examples of how professionals in many different contexts have experienced and handled culture shock experiences in reference to cultural perceptions of the body and body-related themes such as disability, sexuality, etc. 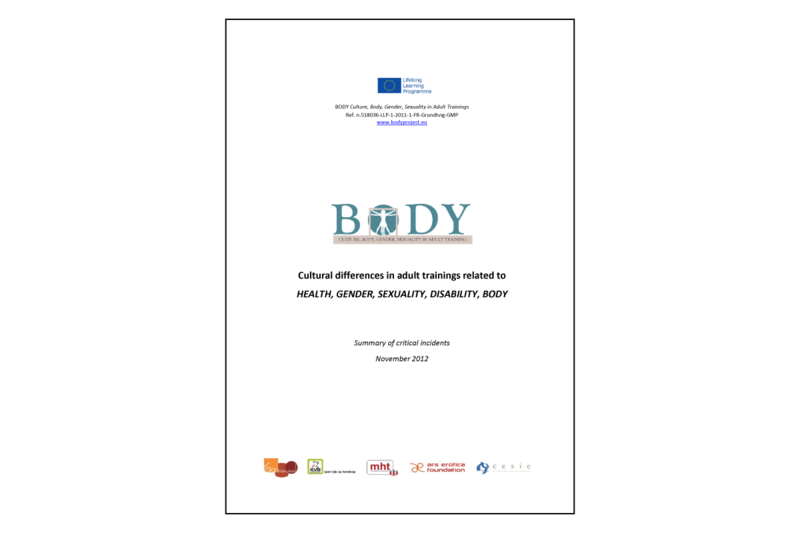 We also collected a wide range of examples that illustrate how people around Europe through professional cultural encounters have developed best practices to accommodate cultural differences anchored in the body. We have distinguished between multiethnicity and multiculturality in order to emphasize that culture is not to be confused with ethnicity or different national origins. The concept of culture covers a much wider diversity, which also includes the cultural diversity that is the result of differences in living conditions, lifestyles, needs and affinities based on variables such as age, gender, socio-economic classes, sociocultural life, education and professions, sexual orientation, state of health, physical and men-tal resources, faith and religion, political beliefs, etc. Thus, culture – and multiculturality – goes far beyond national origins and traditions. At the same time, the growing multiethnicity in Europe is also an indicator that multiculturality will increase in most European countries, in everyday life as well as in working life, where professionals are confronted with multicultural perceptions, needs and expectations when meeting with citizens and users. This goes for frontline staff in the educational sector as well as the healthcare sector, employment sector, social sector, etc. It also implies expectations that the professionals have knowledge and understanding regarding the body-related needs of the individual citizen or segments of citizens. This may be expectations concerning body language, treatment of the body, or how to properly deal with the body in cultural encounters, where the body as well as nonverbal communication plays an important role in mutual understanding and respect between professionals and citizens and users. The study has finally shown that culture is a relative term, which derives its dynamics from the meeting and interaction between different traditions, values and practices. We may, in a Western context, distance ourselves from birth rituals used in distant places. But we may also choose to open our eyes to the inherited methodological experience that a distant ritual represents, and which may contribute to innovative thinking in the Western context. This is, in fact, the essence of intercultural competence and intercultural communication, where we express ourselves through verbal/linguistic as well as nonverbal/bodily sensations and expressions. The methodology we use in the BODY project aims to develop and strengthen intercultural competence focusing on concrete methods and tools to handle intercultural communication in the daily job performance among teachers, supervisors, educators, nurses, social workers and other professionals some-how involved in health, gender, sexuality or the body in general. For practical purposes we have dissected the great domain of BODY somewhat artificially into five themes: gender, sexuality, health, disability and body. This division should by no means suggest that these themes are independent, in fact the significant overlap is evident: for instance specific cultural practices for women who have their period could be tackled through the perspectives of health (e.g. how in health training women are prepared to handle the hygienic aspect of menstruation), gender (gender-specific practices), sexuality (specific practices on women’s sexuality), and even non-verbal communication (do women with their period have to isolate, segregate, communicate differently etc.). Yet, this very simple separation proved useful for the work process, and also for the presentation of an inherently complex and organic domain. Systematized compilation and promotion of innovative best practices in adult trainings that take into account cultural diversity in the domains of health education, sexuality training, gender-related training, and intercultural trainings. The analysis of culture shock experiences, concrete situations called Critical Incidents from both the perspective of the narrator and the other protagonists, opens the space for a better understanding of how our own cultural values. The present anthology aims to supplement and complement the many practical experiences with a selection of articles and texts, which from different angles present a general analytical view of the crossroads of culture and body, highlighting the importance of the body for intercultural encounters between people. The BODY Manual is addressed for adult trainers working in the field of health and disability education, sexuality education, intercultural education, gender related education.